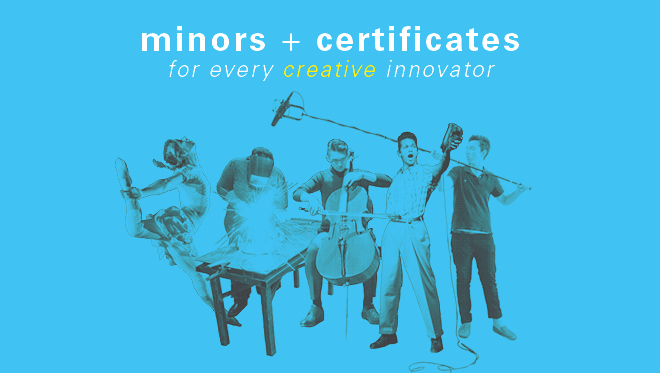 Discover your talent + Earn GER credits! Students who are currently not majoring in art can experience the creative energy of our inter-disciplinary school while fulfilling General Education Requirements. Current Peck School majors may also take advantage of the courses below, or reference the Arts Elective Courses for a more detailed listing. Appreciation of North American art through diverse cultural traditions including African-American, Native-American, Latino-American, Asian-American and European-American expressive practices. †Art 309 – Issues in Contemporary Art (A, CD) Lecture focused on critical issues/theory in contemporary art & culture. Rotating topics include visiting artist lecture series, remix and public art, artists and social movements, or digital practices. Introduction to the visual arts disciplines and contemporary critical concerns. Course themes investigate inter-relations between technical process and expressive intent. Special topic courses in Art and Design for non-art majors. Rotating topics may include photoshop, drawing, typography, ceramics, entrepreneurship, photography, or 3D Art. Introduction to electronic art and imaging. Focus on historical and cultural contexts, theoretical concepts and studio skills using imaging software. Survey of design disciplines and movements of the 19th, 20th and 21st centuries. Slide lectures include industrial design, architecture, graphic design, and design movements. Cross-cultural study of U.S. ethnic and racial identities through materials drawn from a variety of media arts practices (e.g. film, photography, new media) with attention to African-, Asian-, Hispanic- and Native American experiences. Survey of photographic processes and movements of the 19th, 20th, and 21st centuries, with emphasis on historical and cultural contexts that shaped the application of the medium. Theory and practice explored through school-based field experiences, readings, and research. Curriculum design and implementation with an urban focus. 50 hrs of observations in elementary school required. Focus on creative process and communication; and entrepreneurial, professional and cross-disciplinary practices in design and related fields. Topics and critical issues in the modern and/or contemporary field of art. Student research and written/oral reports required. Preparation for graduating seniors with skills needed for a career in the competitive field of art: resumes, grants, budgets, taxes. Experience this century-old tradition while strengthening your body, sharpening your mind & reducing stress. Basic technique, implementation, short compositions, lectures, films and discussions on dance history, philosophy, theory, and survey of current trends. Impress your friends, family (or a date) by learning the waltz, foxtrot, tango & more. Hit the dance floor as you learn the different styles of Hip Hop and develop a deep understanding of the music and culture behind this high-energy form. Relax and relieve stress by learning these simple movements practiced in China for hundreds of years to promote balance and harmony. Experience Latin America through dance and music of Caribbean countries. Develop your inner ballet dancer through the learning of barre and center exercises and the history of the form. Through videos, readings and discussion, lean the characteristics of dance on the African continent and follow these elements as African slaves migrated across North and South American and the Caribbean. Explore your inner rhythm and style through upbeat and fast-paced movement to contemporary and popular music. Start your day in an energetic and stress-relieving way as you explore rhythm, musicality and syncopation. Develop your creative potential using rhythm and movement and improvisation. Enjoy an environment for creative exploration of individual body awareness, integration of body-mind and experiencing the body in space. Develop skills in observation, description and performance of human movement using the work of Rudolf Laban; understand fundamental principles of movement such as body, effort, space, and shape. The dance traditions of Africa and the Diaspora. Lecture course regarding the origins, development and evolution of the American musical theatre. Cross-cultural study of U.S. ethnic & racial identities through a variety of media arts practices (film, photography, new media) with attention to African-, Asian-, Hispanic- & Native American experiences. Lectures, screenings, & discussions by contemporary filmmakers/critics. Subjects include the contemporary state of the art, the condition of the industry, and the relations of film to a critique of culture. Relation of digital cinema to the cultural, philosophical, and technical implications of computing technology. Study of American popular music from 1900 to the present. Beginning class instruction on guitar as an accompanying instrument for folk and pop songs. Basic chording, strumming, and finger picking. Designed as a continuing performance experience. Performs symphonic works for band, performing on campus, statewide tours and national conventions. Made up of undergraduate singers from many academic areas. Non-music majors and community members. Performs orchestral works from the 18th, 19th and 20th centuries. Performance and study of jazz ensemble techniques. A large group of men with a mission to sing and perform outstanding choral literature for both men’s and mixed choirs at the highest artistic levels. A select group of female singers with a mission to sing and perform outstanding choral literature for both women’s and mixed choirs at the highest artistic levels. 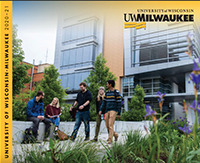 As the most select UWM choral ensemble, we carry a long tradition of the fine choral performances including secular and sacred music from all historical periods and styles. UWM performing ensembles (those denoted above with a ‡) require a placement/seating audition.Placement auditions are held during the first week of each fall semester. More information and audition excerpts can be found by visiting the Ensemble Auditions page. Do you want to continue private lessons on your instrument? Guide to musical enjoyment and understanding, including listening experiences in the various styles and forms of music. Music fundamentals through singing, playing, listening, note reading and creativity for the general university student. The concert as an event: history, traditions, form, make-up, and interpretation. Introduction to the piano and musical notation. Varying uses of the piano is continued and expanded through reading, technique, interpretation, and theory. Group study of singing, including posture, breathing, resonance, range and projection through vocal exercises, varied song repertoire and solo singing. Continuation of Class Voice Level I including vocal health, posture, breathing, phonation, resonance to include repertoire expansion of jazz, popular, folk and blues. Intermediate instruction on guitar. Finger picking, barre chord, bass runs, melody playing, and reading music. Study of musical genres from selected world cultures with an emphasis on musical sound and structure, and performance in cultural context. Vocal and instrumental groups devoted to the study and performance of music from 12th through the 18th century. Explore the intersection of performance & popular culture through sports events, festivals, television, film, social media & radio. Includes field trips and a chance to design your own pop culture event. Performances, demonstrations, & lectures focusing on specific aspects of theatrical production. Attendance at live theatrical performances required. Introduction to the theatre as a form of artistic, social and human expression from point-of-view of both theatre audience and theatre artist. An introduction to basic acting techniques of personalization, focus, and scene study explored through participatory and collaborative exercises and assignments. An introduction to a wide variety of improvisations and games which are designed to free and channel the self expression of performers and non-performers. Explore the intersection of performance and popular culture – through sports events, festivals, television, film, social media and radio. Includes field trips to events and a chance to design your own pop culture event. Introduction to the study, methodologies, and practice of participatory theatre including happenings, environmental theatre, therapeutic theatre, and celebratory theatre. Methods of analysis of the dramatic text for production; the elements of a play through discussion and written analysis of selected works. Development of skills to locate, analyze, and tell stories from multicultural sources and ranging from personal experience to myths and legends. Study of the development of theatre art and its practice, performance, and scripts, from classical antiquity through the 19th century. Study of the development of theatre art and its practice, performance, and scripts from 1900 to the present. Survey of Latin American, Caribbean, and U.S. Latina/o theatre and performance. History and cultures of the Americas that shape these productions. Study of plays and current productions, playwrights, directors, actors, and theatrical practices in selected cities. Credits determined in consultation with instructor.